When most people think of mummy films, they might first picture a bandaged zombie limping about on a killing spree. Classics like The Mummy's Curse (1944) make it easy to understand why that brute force image has left its mark so well. But when looking at Karl Freund's masterpiece The Mummy (1932), it's evident that this film offers something much more sophisticated and unique. 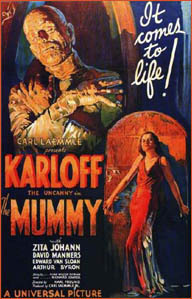 Imhotep (Boris Karloff) is shown in mummified form only briefly at the film's beginning (also during a flashback sequence, but still alive). Freund does offer generous glimpses, however, allowing us to share in the intensity as Dr. Muller (Edward Van Sloan) and Ralph Norton (Bramwell Fletcher) observe. They quickly deduce that Imhotep had been buried alive. While Muller and Joseph Whemple (Arthur Byron) discuss their mummy outdoors, Norton unwittingly revives Imhotep by reading the Scroll of Thoth...which they had unearthed as well. Once out of his sarcophagus, it becomes evident that killing is not this mummy's first priority. He ignores Norton, takes the scroll and exits. The scene is drenched beautifully in near silence until Norton's legendary hysterics. Imhotep returns some years later to a new expedition headed by Joseph Whemple's son Frank (David Manners). Posing as an elder citizen named Ardeth Bay, he directs Whemple to the tomb of his beloved Princess Anckesen-Amon: the woman he'd committed sacrilege and died for. She's exhumed and placed in a museum where Imhotep tries to raise her using the magic scroll. The incantation is foiled by a museum guard - but not before it affects Helen Grosvenor (Zita Johann). She IS the princess reincarnated...and is mesmerized by Imhotep's mystic power. It now becomes quite the complex love triangle involving the dead, the undead and the living. Way beyond a "mummy movie". Helen not only wins the favor of Imhotep, but of Frank Whemple. Now the love triangle is a square. Under the guidance of Dr. Muller, Whemple attempts to save Helen from Imhotep, after realizing just who he was and what he wanted: rather than raise Anckensen-Amon's mummy, Imhotep meant to kill and raise Helen... so she too could be undead. Subtle yet potent wizardry makes Imhotep unstoppable, until Helen's dire cries are answered by Isis herself. Boris Karloff dominates this movie with his eyes and stature. It's a true testament to his horrific greatness. Van Sloan is his lovable, monster-slaying self...but is reduced to an onlooker as a frantic Zita Johann brings down the hammer. Rest in pieces, Imhotep.